The disease affects the corals that are the framework-builders for the reef tract. After stony coral tissue loss disease reached the Lower Keys last spring, the disease seemed to stall. Reef scientists were hoping that meant it might peter out. Andrew Bruckner, research coordinator for the Florida Keys National Marine Sanctuary, got back out on the water this week, after the federal shutdown ended. "The most alarming thing is that the disease has advanced to the west," he said. "It's actually reached past Key West — we've seen it as far as Eastern Dry Rocks." Researchers say they think a bacteria causes the disease, which starts at the edge or in a patch of a coral colony and spreads, leaving dead tissue in its wake. The disease reached Looe Key, off the Lower Keys, last spring. Its progress to the west seemed to stop, which gave researchers hope. But Bruckner said it reached American Shoal in November, and now has gone past Key West. The disease is showing up so far only in the outer reef areas. That's good news, because that means the inner patch reefs are still unaffected. But it's bad news because the outer reefs are in special zones called Sanctuary Preservation Areas, where no fishing is allowed. "These are the outer forereef environments, where all the mooring buoys are, where most of the visitors go to snorkel and dive," he said. "It's also the cleanest water, the nicest places really to dive." Since those areas are popular, Bruckner says divers should take special care to decontaminate their gear, so they don't accidentally spread the disease. "Bacteria will stick to your wetsuit material, they'll be inside the bladder of your [buoyancy compensator]," he said. "So it is very possible if you're in an area that has a high number of diseased corals and say, you come in contact with the bottom or you accidentally touch a coral that you could pick up some of that bacteria and then transmit it somewhere else." The sanctuary has recommendations on its website for how to decontaminate gear after dives. "It's really most critical to do that in between when you're in an affected area and you're going to go to another area that's quite far away," he said. The city of Key West took the first step Tuesday toward becoming the first place on the mainland U.S. to ban the sale of sunscreens that contain certain chemicals, like oxybenzone and octinoxate, which some studies have shown can harm corals. Time is running out to save the world’s coral reefs from irreversible damage, according to numerous studies. A quarter of the world’s marine species depend on coral reefs for habitat. A half-billion people rely on them for their livelihoods or sustenance. 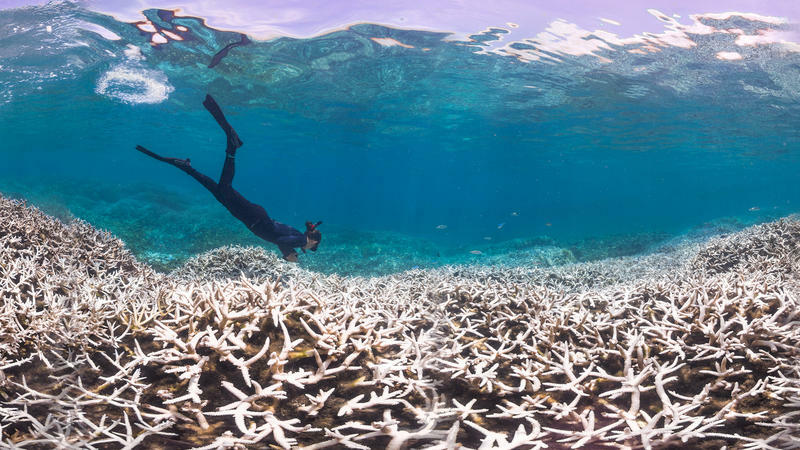 Researchers say we’re now in the midst of the third global coral bleaching event in less than 20 years. And that by the time it’s all played out, the world may have lost another 5 percent of its corals, with a murky future ahead for the rest.